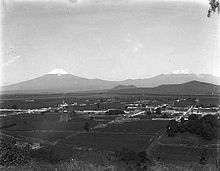 "Popocatépetl and Iztaccíhuatl" refers to the volcanoes Popocatépetl ("the Smoking Mountain") and Iztaccíhuatl ("white woman" in Nahuatl, sometimes called the Mujer Dormida "sleeping woman" in Spanish) which overlook the Valley of Mexico and the various myths explaining their existence. The most common variety relates the Nahua romance of the princess Iztaccíhuatl and the warrior Popocatépetl. This tale is recorded in several different versions. A summary based on one version as recounted at a September 2006 "Myth, Mortals and Immortality: Works from the Museo Soumaya de México" exhibition at the Smithsonian Institution. Popocatépetl from near the summit of Iztaccíhuatl. Iztaccíhuatl's father sent Popocatépetl to war in Oaxaca, promising him his daughter as his wife if he returned. Iztaccíhuatl's father presumed he would not return and so arranged several suitors for his beloved daughter. When Iztaccíhuatl heard of this she killed herself with a dagger, because she knew that Popocatépetl would never survive in battle and did not want to marry anyone else. When Popocatépetl returned, and discovered the death of his lover, he took her to the top of the mountain, hoping the cold would wake her, but instead, he got frozen. God covered them with snow and changed them into mountains. Iztaccíhuatl's mountain was called "La Mujer Dormida" ("The Sleeping Woman") because it bears a resemblance to a woman sleeping on her back. Popocatépetl became the volcano Popocatépetl, raining fire on the earth in blind rage at the loss of his beloved. Many years before conquistador Hernán Cortés came to Mexico, the Aztecs lived in Tenochtitlan, today's Mexico City. The chief of the Aztecs was a famous Emperor, who was loved by all the natives. The Emperor and his wife, the Empress, were very worried because they had no children. One day the Empress said to the Emperor that she was going to give birth to a child. A baby girl was born and she was as beautiful as her mother. They called her Iztaccíhuatl, which in Náhuatl means "white lady". All the natives loved Izta and her parents prepared her to be the Empress of the Aztecs. When she grew up, she fell in love with a captain of a tribe, his name was Popoca. One day, a war broke out and the Aztec warriors had to go South to fight the enemy. The Emperor told Popoca that he had to bring the head of the enemy chief back from the war, so he could marry his daughter. After several months of combat, a warrior who hated Popoca sent a false message to the Emperor. The message said that his army had won the war, but that Popoca had died in battle. The Emperor was very sad when he heard the news, and when Izta heard she could not stop crying. She refused to go out and did not eat any more. A few days later, she became ill and she died of sadness. When the Emperor was preparing Izta's funeral, Popoca and his warriors arrived victorious from war. The Emperor was taken aback when he saw Popoca, and he told him that other warriors had announced his death. Then, he told him that Izta had died. Popoca was very sad. He took Izta's body and left the town. He walked a long way until he arrived at some mountains where he ordered his warriors to build a funeral table with flowers and he put Izta lying on top. Then he kneeled down to watch over Izta and died of sadness too. The Gods were touched by Popoca's sacrifice and turned the tables and the bodies into great volcanoes. The biggest volcano is Popocatépetl, which in Náhuatl means "smoking mountain". He sometimes throws out smoke, showing that he is still watching over Iztaccíhuatl, who sleeps by his side. Another tale is much like the one before: Some warriors did not want Popoca to be with Izta, since they liked her themselves; and sent a message to the emperor saying that Popoca died. Izta became very sad and died of grief. When Popoca returned, he heard about Izta's death and became sad himself. He went out of town with Izta's body and ordered his soldiers to make a mound for him and Izta. He put Izta's body on one mound and got onto the other with a smoking torch. He remains there forever, looking after Izta, and, as time passed, dirt, snow, rocks, and Mother Nature covered them, turning them into great mountains. Popoca's torch is still smoking as a reminder of what happened.